This page is maintained by the staff of the Aeronautics Department at Sacramento City College. 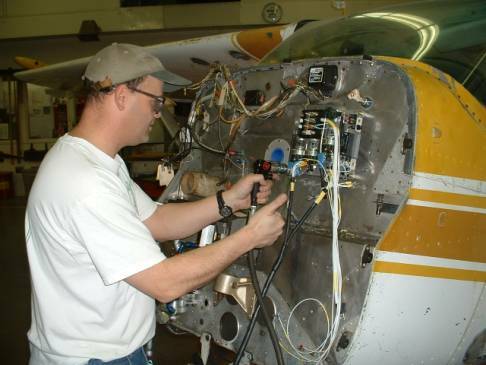 Sacramento City College has been training aircraft mechanics (A&Ps) since 1932. As such it is the oldest continuously operating A&P school in a community college in the US. Here are some FAQs about our school. Aircraft mechanics maintain and repair everything that flies in this county, except military aircraft, from the smallest Cessna to the giant Boeing and Airbus transport aircraft. The airlines start their mechanics at about $15 per hour and usually advance to about $25 within 2 to 5 years. In addition they provide medical benefits and a retirement program. Mechanics working on smaller aircraft at local airports usually earn $10 to $15 per hour, with varying benefits. All of the Fall of 2004 graduates of Sacramento City College were hired before the end of their final semester, with many receiving multiple job offers. The FAA oversees all the training schools in the US and they mandate that all students receive 1900 hours of instruction. SCC and most other schools divide this into 4 semesters. Tuition for full time students who are California residents is $416 per semester. These fees are among the lowest in the US. Out of state residents pay considerably more, $2800 per semester. In state fees apply to applicants who have been in California for 6 months. (check this) At this time, SCC is able to provide all the textbooks needed for the course for a refundable fee of only $5 per text. Additionally students pay a $25 refundable tool deposit. Our classes average 25 to 30 students. Each class is taught by an instructor, an instructional assistant and includes a tool room attendant. Students enjoy ready access to their instructors. Sacramento is the capitol of California. It is located in the northern part of the state and is a city of about 750,000 people. Go to our website, http://www.scc.losrios.edu/ and follow the links through "Programs of Study", "Career Certificate", "Advanced Transprtaion Technology" to "Aeronautics."